Besides the obvious benefits they bring, it looks like we owe our very existence to plants, which helped prevent the Earth from freezing over during the past 25 million years. About 50 million years ago, Earth was a hothouse – the poles were ice free, and crocodiles lived in the Arctic. Then, the concentration of carbon dioxide in the atmosphere started dropping from around 1000-1500 parts per million (ppm), and the Earth began to cool. By about 24 million years ago, the uplift of the Himalayan and Andes mountain ranges led to large-scale weathering of rocks, a process that removes massive amounts of CO2 from the atmosphere. This reduced the greenhouse effect and cooled the planet. But something kept the CO2 levels from dropping beyond a certain point, preventing Earth from turning into an icehouse. Now, Mark Pagani of Yale University in New Haven, Connecticut, and colleagues have identified our saviours: plants. Trees play an important role in the sequestration of atmospheric CO2 in magnesium and calcium carbonate rocks. As mountains grow, rocks break down and become transported to the foothills, where trees hold them in place in the soil and break them down into minerals. These then combine with CO2 to form, for example, limestone. 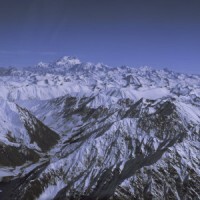 The Himalaya’s, a young mountain range, still rising 5 mm every year! The team used computer models to simulate the sensitivity of vegetation to atmospheric CO2 and climate, and found that as the CO2 concentration dropped to about 200 parts per million, the plants started starving and suffocating. This caused a negative feedback, preventing weathered rocks from turning into carbonates, thus putting a natural brake on the sequestration process and letting CO2 levels rise again. “The carbon dioxide level came down and banged up against this lower limit, and has more or less been banging up against this lower limit for the last 20 odd million years,” says team member Ken Caldeira, of the Carnegie Institution of Washington in Stanford, California. “Plants played a critical role in preventing the Earth from going into a deep freeze.” Mathew Huber, a climate scientist at Purdue University in Lafayette, Indiana, says that the work provides a “nice explanation of a negative feedback in the climate system“. a. What is the concentration of carbon dioxyde in the atmosphere nowadays? b. What is the connection between the dropping ppm of CO2 and the cooling? 2. ‘… the uplift of the Himalayan and Andes mountain ranges …’: what is the cause of the rising of these mountains? How did this remove CO2 from the atmosphere? Write the formula of the chemical reaction involved. 3. What is the role of plants in reducing the CO2 in the atmosphere – and what is their role in stopping the reduction? 4. What do we mean with ‘negative feedback’? Do you know other examples of negative feedback? 5. Before higher, multicellular organisms evolved (about 600 miljon years ago) the earth went through a period of very low temperatures (“Snowball Earth”)- perhaps during a million years! Plants could not help at that time, they did not exist. Scientists believe big volcanic eruptions helped to raise the earth’s temperature. Can you explain how (local) volcanism can help raise the temperature all over the world? 6. In our time we need not be afraid of a freezing earth, but we have to worry about rising temperatures. How can plants also help now to ‘save the world’ from that danger? (i.e. to save the level of temperatures we are used to). 7. When the climate of the earth gets warmer, we will also get ‘positive feedback’, f.i. when the northern tundra’s melt and methane (‘marsh-gas’), now frozen in the marshes, comes free. What will be the result of this? 8. Why should we try to prevent the climate change? The planet has been hotter and also colder in its long history. Give reasons why climate change can be a bad thing, and reasons why it can also be a good thing, and discuss in your group what is more important.